Grand Central Publishing, 9781455573653, 240pp. Deborah McKinlay has published half a dozen non-fiction titles in the UK, and her books have been translated into numerous languages. Her work has appeared in British Vogue, Cosmopolitan, and Esquire. She lives in South West England. How rewarding to perch on the shoulder of a character Barbara Pym might have conjured-a late bloomer who possesses "brickish stoicism" and brews tea on an Aga. So when the British author Deborah McKinlay takes us to "the depths of the English countryside, in a house that was an advertisement for the English countryside," we recognize that a Lively voice-à la Penelope, that is-will be reporting with wry detachment and affection. That Part Was True is part epistolary, beginning with a fan letter sent by Eve Petworth to Jackson Cooper, a ­Robert-Parkeresque, best-selling American novelist. Cooking earns a starring role in their correspondence; as it continues, he begins to think of her as "his food friend," enjoying on paper "a chaste, if warm, thing based on a mutual interest." Poor Eve, a divorced romantic pessimist, suffers anxiety attacks, brought on by almost anything outside her four walls. Her daughter, Izzy, and Eve herself consider Eve to have been very bad at mothering. And now Izzy's coming wedding introduces additional angst in the form of Simon, the long-estranged ex-husband and thrice-married father, who is making up for lost time and absent scruples. Equal space is devoted to Jack, twice-divorced, sort of enjoying bachelorhood in the Hamptons. "For the past 15 years, women had been trying to please him. Not many had managed it." Several now seem "gluey." Especially skillfully rendered is his affair with a diffident New Yorker, Adrienne, a dispenser of unwanted editorial advice. Worse-she's a vegetarian who hardly eats! Mineral water and a salad don't keep good company with omnivore, gourmand Jack. Far-off Eve, on the other hand, is a safe, quixotic object of affection and a source of recipes. Will a culinary correspondence ("Mutton is good with plums") be enough to fan a flame? I worried that invitations to rendezvous in Paris were premature and unearned or, as Eve's housekeeper warns, "dodgy." But mercifully, Jack and Eve think so too. Jack wishes "he hadn't said that stuff to Eve; it sounded pretentious in the daylight." Will these pen pals actually meet in a cafe on the Left Bank? McKinlay teases us, allowing them to correspond with a bit more ardor than their nonacquaintance warrants. If we occasionally wince at Jack baring his soul, going poetic, and with Eve responding in kind ("When it had all gone-my buoyant roundness and openness to joy-when it had been stripped away, I tried to forget everything"), we understand that distance and semi-anonymity are making them brave. 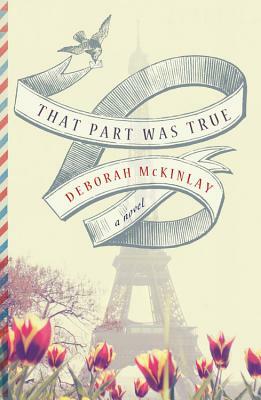 A charming and quick read, That Part was True introduces two innocuous, somewhat lonely, characters who forge an unlikely friendship through mailed letters. The pair's platonic relationship is comforting and reliably innocent, yet their discussion of food and love is wonderfully sensory. The ending is hardly unexpected, but provides a nice wrap-up to this quiet, slice-of-life tale.